Rock cod is abundant in the southwest coast. When it's fresh, the texture of its flesh is so chewy and soft. This one is grilled and served with plantain. 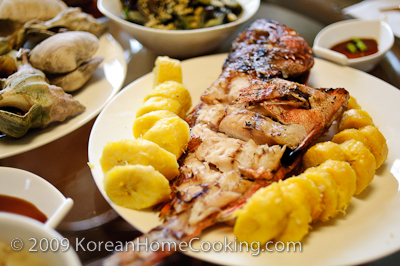 By the way, this dish looks very non-Korean, since neither rock cod or plantain is native to Korea. 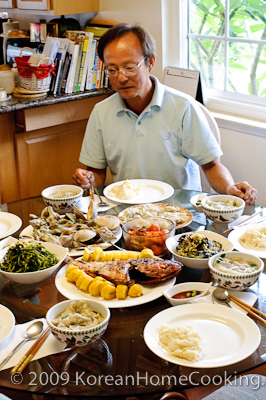 My parents literally open a seafood fare when we are visiting because Min doesn't like meat. 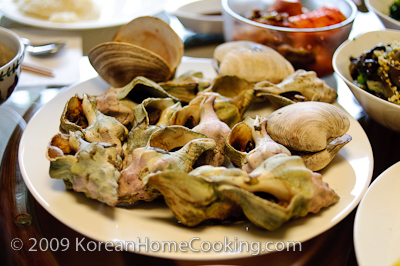 To add some varieties as well as weights to the table, my dad had also bought some trumpet shells and clams in the market. 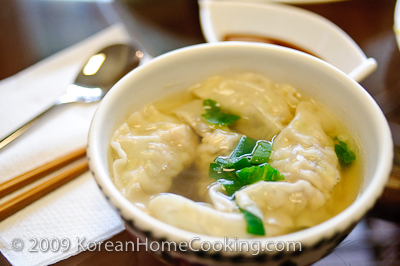 The main dish is actually this dumpling soup which is made with the fresh home-made dumplings. 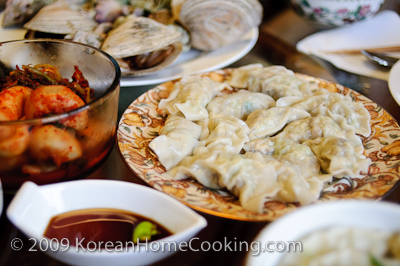 Once you've made dumplings, making of dumpling-soup is a breeze. See the instruction below for dumpling soup. 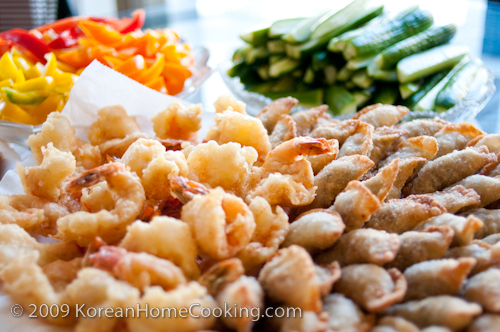 If you would like to enjoy as snacks, deep frying tastes good, too. Or you can enjoy water dumpling, so called mulmaandoo which is similar to steamed dumpling, but made by boiling them in water. 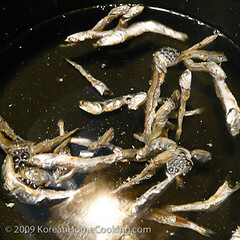 Make anchovy stock by boiling anchovies in water for 5+ minutes. Fish out anchovies afterwards. Add dumplings and the rest of the ingredients to the stock and bring to boil once again. Then serve. Wow - your mother is an amazing cook (and so are you)! Such beautiful food - and what generosity! There's a lot of love expressed in this feast.